That’s our kind of fundraiser! First, the easy part: all three incumbents – Senator Susan Lee and Delegates Ariana Kelly and Marc Korman – are running as a team and are headed to reelection. Lee has historically been one of the delegation’s best fundraisers (although Korman surpassed her by a little bit this cycle). Kelly is beloved by advocates for families, women and children for her work on their issues and has emerged as a leader on ridding Annapolis of sexual harassment. Korman is a rare bird: a lawyer who is good with numbers. Metro riders everywhere should thank him for his tenacious work to improve WMATA. Great things are predicted for Korman so long as he does not return to blogging. Attorney Sara Love and MCPS teacher Samir Paul are the top non-incumbents vying for the seat being vacated by Delegate Bill Frick, who is running for County Executive. Love and Paul would be great candidates in any part of the county, but unfortunately for them, they are running in the same district. Love fits in well with the progressive female voters who dominate District 16 primaries. Paul is a teacher who has been active in MCEA (which has endorsed him), but his message is much bigger than education as he draws links between all public institutions that confer benefits but require investment, especially WMATA. Love and Paul had super fundraising performances and are essentially equal in cash on hand. Those who have met them are impressed with both of them, but sadly, there is only one open seat. The Big Question: will Frick, who filed a disappointing January report, drop back down to the House race? We know Frick does not enjoy that question, but since he withdrew from the Attorney General’s race and refiled for Delegate at the last hour in 2014, this is on everybody’s mind. Such a move by Frick would probably result in all four incumbents being reelected, wasting huge time and effort by Love and Paul. This district is a mess. The only certainty here is that Senator Cheryl Kagan and Delegate Kumar Barve will be reelected, assuming that Kagan is not picked up by a gubernatorial candidate as a running mate. As for everything else… well. At the root of the mess is Delegate Jim Gilchrist. By all accounts, he is a nice guy who never causes trouble. His defenders describe him as a studious, intellectual workhorse who gets into the weeds and doesn’t claim credit for anything. But he has little tangible to show for three terms in office. He has passed no signature legislation. His website is inactive. His Facebook page has not been updated since 2014 as of this writing. And his fundraising is weak. Consider this: since 2006, Gilchrist has raised a total of $83,217 from others, an average of $27,739 per cycle. (He has also self-financed $11,120 over that period.) MoCo has a bunch of candidates who can raise $27,000 in a month. 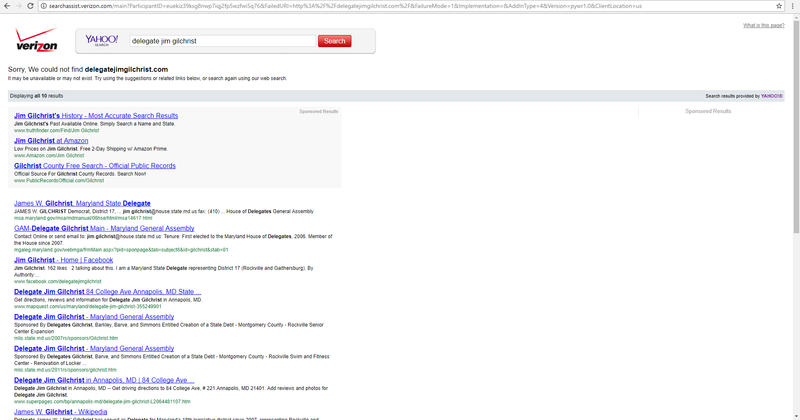 The search result for Gilchrist’s website less than five months from election day. So why does he keep winning office? He has a guardian angel: Barve, who is his committee chair and likes him. Barve slates with him regularly and appears in joint mailers with him. Gilchrist would be a goner in most districts, but with Barve helping him, he survives. And that has caused grumbling in some parts of District 17. This time, Rockville City Council Member Julie Palakovich Carr decided to run for Delegate in July even when it appeared that all three incumbents (Barve, Gilchrist and Andrew Platt) were running for reelection. Six months later, Platt dropped out and Barve and Gilchrist quickly decided to slate with Palakovich Carr. That’s when simmering tensions erupted into the open. Kagan, who is no fan of Gilchrist, announced that she was not endorsing the Delegate slate, at least not yet. This is almost unheard of; in virtually all cases when incumbent Delegates form a slate and none of them are challenging the sitting Senator, the Senator participates. And when Kagan posted her decision on Facebook, the Mayor of Gaithersburg and two Gaithersburg City Council Members voiced their displeasure with the slate. Open dissatisfaction with the Delegate slate surfaces on Kagan’s Facebook page. 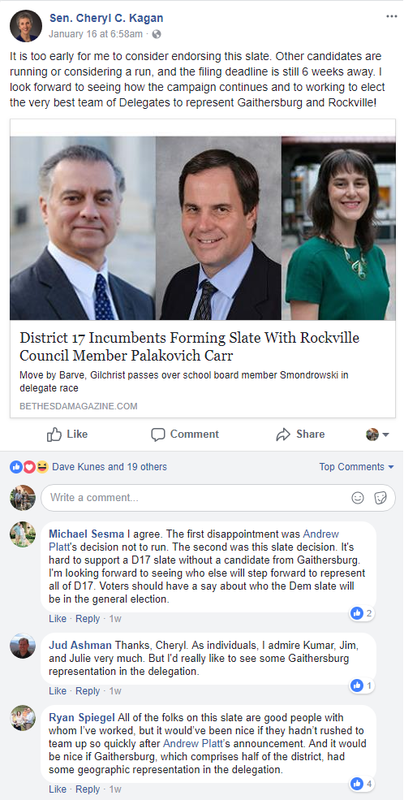 The nominal reason expressed by some for their unhappiness is that with the inclusion of Palakovich Carr, all three slate members are from Rockville and none are from Gaithersburg. (The two cities are roughly equal in size.) But lurking underneath is festering discontent with Gilchrist’s performance in office. Some would prefer open competition in part because it might lead to Gilchrist’s defeat, but instead they got another slate designed to protect him. Two Gaithersburg House candidates – school board member Rebecca Smondrowski and attorney Julian Haffner (who is married to a City Council Member) – have now entered the race. Barve is the only Delegate candidate with any real money, so all the others have a lot of work to do. The Big Questions: will the Gaithersburg grumblers step up and organize for one or more of the House candidates from their city? Or will they cut their losses and make their peace with Barve and his slate-mates? And what, if anything, will Kagan do? My family, like so many others, came to America for freedom and opportunity. As they left India and traveled across the Atlantic they knew they would face hardships but they were hopeful that they would succeed. Now, that dream is in jeopardy for millions of American families. There is no longer confidence that working hard and playing by the rules means being able to provide for your family. I am announcing today that I’m running for the open 8th congressional district of Maryland to help rebuild our middle class, restore hope in the American Dream, and grow our economy so that everyone has an opportunity to thrive and the freedom to live as they wish. I made history in 1990 at the age of thirty-two when I was elected to the Maryland House of Delegates and became first Indian-American ever to serve in a state legislature. For 25 years as a legislator, I have worked to earn your trust. As Majority Leader in the Maryland House of Delegates, I helped lead the effort to build the best public school system in America. I worked to foster economic growth through investments in biotechnology and information technology. I also fought to raise the minimum wage, expand health care to working families and keep college tuitions low. Today, as Chairman of the Environment and Transportation Committee, I’m battling the Republican agenda to roll back environmental protections that make our families and communities safe. In the private sector, I’m an accountant and the Chief Financial Officer of a local environmental and hazardous waste remediation company. I know how to create jobs, promote the private sector and still protect the environment. I am ready to take my experience working for economic growth and fighting for our middle class to the federal level. I will build on the legacy of my friend, Congressman Chris Van Hollen, who is seeking the open Senate seat. When my dad crossed the Atlantic in 1958, wondering what America held for him and his family, he probably never imagined his son would ever get the opportunity to run for Congress. This isn’t going to be easy. Offering bold and innovative proposals to rebuild our middle class and grow our economy never is. But with your help, we can do this together and make our country great again for everyone. 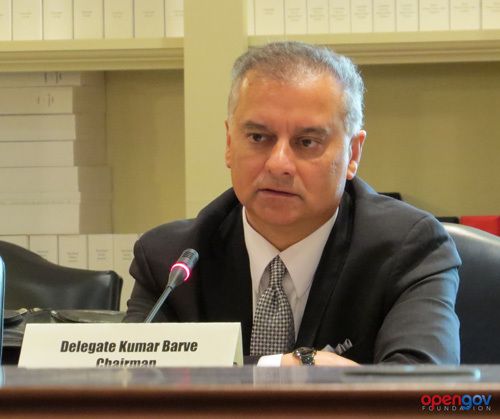 Delegate Kumar Barve (D-17) intends to announce very soon that he will run for the Eighth Congressional District made vacant by Chris Van Hollen’s senatorial bid. Though born in New York, Barve went to Paint Branch High School. Barve was first elected to the House of Delegates in 1990, so he is now in his seventh state (pun unintended) legislative term. Currently, he chairs the Environment and Transportation Committee. Barve has also served previously as Majority Leader. 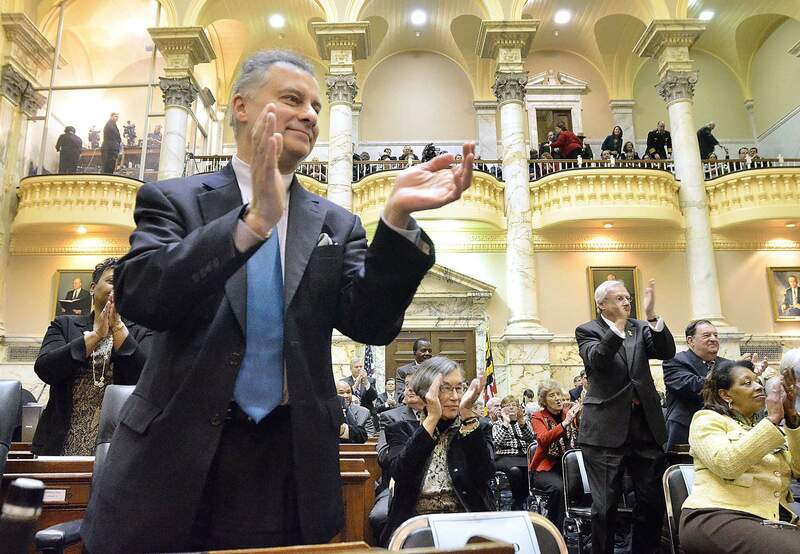 While it may seem ordinary now, it was a big deal when Del. Barve was first elected in 1990, as he was the first Indian American to win election to any state legislature in the country. At the time, he was also the only nonwhite member of the Montgomery delegation. Kumar has supported efforts of other South Asians to win election, including Del. Aruna Miller (D-15) and former Del. Sam Arora (D-19). Miller and Barve have remained close. But no one was more peeved when Arora reneged on his commitment to back marriage equality–a bill that Barve sponsored and supported strongly. 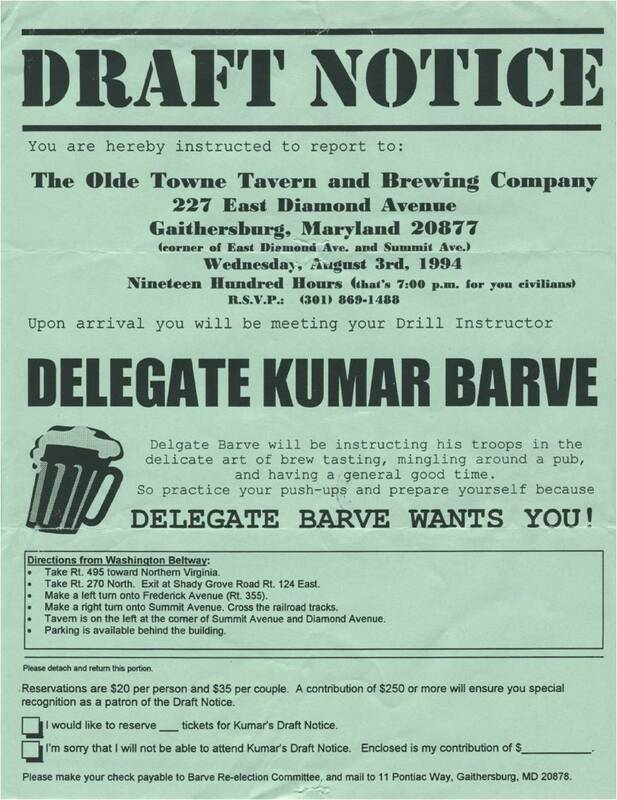 Barve has the potential to receive substantial ethnic backing from Indian Americans not just locally but nationally. Currently, Rep. Ami Bera (D-CA) is the sole South Asian American in Congress. Barve provides a strong opportunity to increase their number. He would also be the first Hindu Indian American in Congress and only its second Hindu member. The 17th Legislative District includes all of the Cities of Rockville and Gaithersburg. The bad news for Barve is that the Eighth Congressional District includes Rockville but not Gaithersburg so about one-half of his legislative district is outside the congressional district that he seeks to represent. The good news for him is that Rockville voters participate in primaries at a much a higher rate than in Gaithersburg, so he is hemorrhaging much less support due to district boundaries than appears at first glance. Until 2014, Kumar also represented much smaller Garrett Park, which is also in the Eighth. Nonetheless, District 17 casts fewer Democratic primary votes than in either District 18 or District 20. Assuming that either or both Sens. Rich Madaleno (D-18) or Jamie Raskin (D-20) run, they each start out already representing at least 50% more primary voters. It will take more effort–and more money–for Barve to introduce himself to new voters. I don’t see real overlap between Del. Barve and other candidates. He’ll probably start out with more experience in office than any of them. But they will all essentially share rather similar principles and struggle to accentuate differences. Kumar’s real challenges are to raise money and to run a disciplined campaign. As for all candidates, he will need to spend far more time raising money than any sane person desires. And he will have to make sure it is spent very wisely. Another key question is whether he can attract volunteers on the same scale and organize them as well as candidates who made their first bid for office more recently, and thus may have more of their original core supporters around to help them. It will be interesting to see how much traction Del. Barve gains in the race. But I don’t think he will get lost in the shuffle. He is outspoken and certainly as ambitious as anyone seeking this seat. Will Del. Barve be tempted to switch to the Sixth District if Rep. Delaney jumps into the Senate race? After all, he lives in the Sixth even if his legislative district falls equally in the Eighth. If they hadn’t left the House, Brian Feldman and Justin Ross would both be on the list too. Geographic balance suggests that the chair would have to be from Montgomery County–Maryland’s largest jurisdiction and particularly large Democratic delegation can’t be chair-less. Promoting gender balance in the leadership would favor a woman for the spot. Otherwise, there would be a very non-PC 1-5 gender split and Democrats tend to be especially obsessed with such things. Both of these would favor the smart, hard charging Education Subcommittee Chair Anne Kaiser. On the other hand, Revenues Subcommittee Chair Bill Frick is one of the brightest intellects that the House of Delegates has seen in some time. He is also well-liked in Annapolis, although rumor has it his aborted AG Campaign may have rankled some in leadership as well as his District 16 colleagues. Regardless, Frick is an immensely talented politician. If he became Chair, he would become a strong candidate to become Speaker (whenever Mike Busch moves on). Majority Leader Kumar Barve, who would be first AAPI Committee Chair. However, it would be a somewhat lateral move, as he would have to surrender his spot as Majority Leader. Frick or Kaiser would each have an excellent shot at becoming Majority Leader if Barve took the helm at Ways and Means. But so would John Bohanon or Talmadge Branch. Am I completely off base? Send questions, comments and complaints to johnga.ems@gmail.com. David Lublin is Professor of Government in the School of Public Affairs at American University and the former Mayor of the Town of Chevy Chase. Opinions are those of the post author.